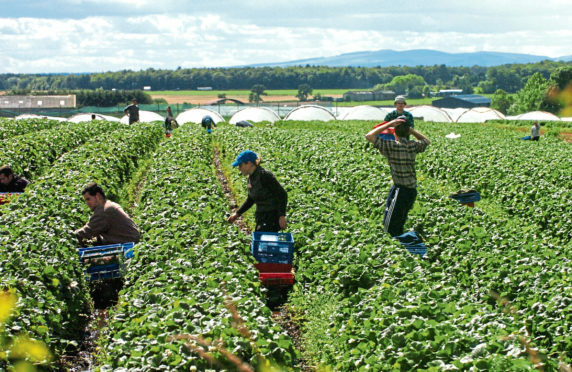 More than 9,000 migrant seasonal workers were needed on Scottish farms last year. Farm leaders welcomed news of a pilot visa scheme for seasonal farm workers but warned it falls far short of industry requirements. The UK Government has announced plans for a two-year pilot visa scheme to bring up to 2,500 workers from outside the EU to work on UK farms (full story on page 4). It said the scheme was designed to alleviate labour shortages during peak production periods, and that farmers must look at ways technology could reduce their demands for labour. Farmers’ union NFU Scotland, which has lobbied hard for a scheme to be established for seasonal workers, welcomed the news but warned it was not enough to meet industry needs. The union’s horticultural committee chairman James Porter – a soft-fruit grower from Angus – said problems in securing sufficient seasonal labour had been a major factor in high-value crops of Scottish soft fruit and vegetables going unpicked in the past two seasons. “This announcement is a step in the right direction and, in our view, has the potential to go much further,” said Mr Porter. He said the principle of concerns over a seasonal workforce has been accepted but the figure of 2,500 permits, given that it is on a UK-wide basis, is “significantly short of what is likely to be needed to make a difference to the labour needs of the sector”. He said the devil would be in the detail but if the pilot scheme proved to be flexible and responsive to the likely numbers of seasonal workers required, it would help address the challenge of finding seasonal staff for Scottish farms next year and beyond. He said the SRUC study found that Scottish farmers needed around 9,250 migrant workers last year, and in the UK as a whole around 90,000 are needed every year. Mr Thomson added: “It will be interesting to see how it pans out. A Scottish Government spokesman said it was disappointing that the UK Government had not consulted it on the proposals.